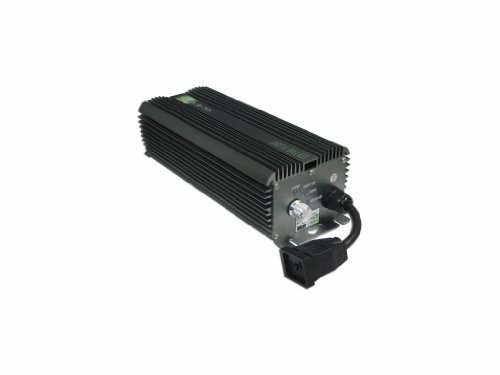 400/250 WATT DIMMABLE DIGITAL BALLAST - Solis-Tek High Quality Digital Ballasts Ignition Control and Connection Awareness Technology -4 step dimming: 400W SolisBoost - 400W - 250W SolisBoost - 250W. -Metal Halide (MH) & High Pressure Sodium (HPS) Lamps -2 power cords included -Soft Start Technology -Powers 400w lamps -Constant Power Factor 99.9% -3.75 AMPS at 120v / 1.87 AMPS at 240v Ignition Control - The only ballast(s) that will ignite your lamps sequentially, one at a time, with soft start technology for true efficiency. This revolutionary safety feature prevents surges and spikes in your electrical circuit and prevents breakers from overloading. Whether you are powering up 10 or 100 units of Solis-Tek Ballasts, the electrical draw is controlled by our internal software for maximizing your electrical efficiency. This is especially important for automated systems to protect against inconsistency in lighting schedules. SenseSmart Technology - (Pre-Ignition Checks) - Solis-Tek ballasts will not ignite without a complete and proper connection. The ballast conducts a 3 second test of the connection circuit. If the circuit is incomplete ignition will be prevented in order to protect the lamp. PRE-IGNITION CHECKS FOR: -Open Output -Short Circuit -Ignition Failure -Thermal -End of Lamp Life -Overflow Current -Over/Low Voltage -High/Low Temperatures SOLISBOOST OVERDRIVE: Contrary to industry standards, SolisBoost will only overdrive the lamp 5% more. We fine tuned the overdrive in order to prolong the life of the lamp and increase overall efficiency.